Just three weeks after the Potomac River turned the Georgetown waterfront into a pond, three of the areas flagship restaurants have reopened. Nick's Riverside Grille, Tony and Joes, and Sequoia, are all open for business on Mother's Day. "It was a herculean task, with hundreds of our employees chipping in to the effort," said Nick Cibel, owner of the Riverside Grille. "It's been an around-the-clock undertaking." Cibel thanked the D.C. health department and the Alcohol Control Board for fast-tracking the restaurant's reopening. Over ten feet of water swamped the waterfront on April 18, flooding underground garages and causing building evacuations. Flood walls installed specifically to prevent such a catastrophe were left partially open the day after a major storm system dumped on the region. 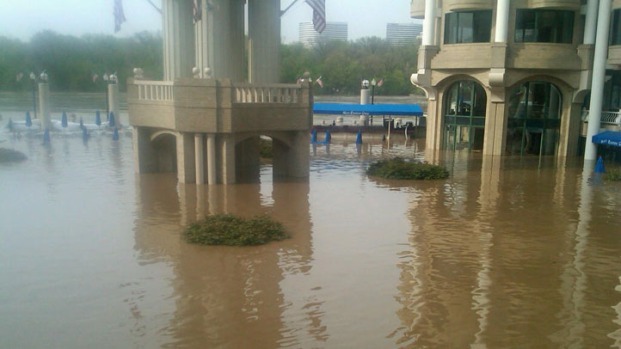 The flooded restaurants along the Georgetown Waterfront are cleaning up to reopen for Mother's Day. While the inside of buildings, which were partially covered in river silt, are still under renovation, the three restaurants will be serving on their patios. Nick's Riverside Grille and Tony and Joes' are sharing a grill while the kitchens are under repair. "We're going to have fresh seafood, and burgers on the grill, just like you were at a tailgate," said Gregory Casten, of Nick's Riverside. Employees at the three restaurants are back to work on Sunday, but many others remain idle as the cleanup continues. A bartender at Farmers and Fishers restaurant, also on the waterfront, initiated a $5 million class-action lawsuit against the National Harbour's management company, MRP Realty. The lawsuit seeks compensation for wages lost by restaurant and retail employees who can't work because of the flooding. Farmers and Fishers remained closed on Sunday. The architect of Washington Harbour says Monday's flooding could have been prevented.